Chronic bruxism puts repeated pressure on the muscles, tissues, and other structures around your jaw the symptoms of which can lead to more serious jaw problems such as TMJ - temporomandibular joint problems. It is important to identify and treat symptoms of TMJearly in order to avoid severe and chronic future jaw pain. Treating the underlying bruxism is a necessary first line of defense! At Indianapolis Dentistry, located in Greenwood, Dr. Ted Reese utilizes a mouth guard better known as a brux guard in order to efficiently and effectively reduce pain, prevent permanent damage to the teeth, and reduce clenching as much as possible. 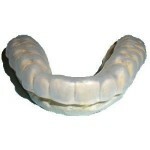 A brux guard is a bite plate that can be fitted easily and accurately at chairside in minutes, resulting in a safe, comfortable and efficacious solution for bruxers. The secret of brux guards are in their combination of plastics that create a bite plate that is soft against the teeth but hard at the base to eliminate bite-through. Don’t wait until bruxism limits your daily/nightly activities and enjoyment in the things you love! Take control of your life and mouth today by calling or visiting Indianapolis Dentistry and inquiring as to how they can quickly and easily fit you with a brux guard.